battery supply, resulting in flat batteries, difficulty in starting etc. 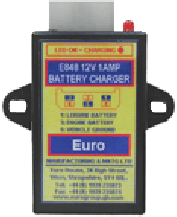 for 12V and 24V Vehicles. A Low Power Control Wire has been included to Start and Stop the Charger, reducing the need for High Current On / Off Switches. This wire also senses the input voltage. Protection against reverse polarity connection is achieved using external fuses. either solar or mains charging systems. It transfers charge from the leisure battery to the engine battery.